Yi Shen is Associate Professor and Research Environments Librarian at Virginia Tech. Shen holds a Ph.D. degree in Information Studies from the University of Wisconsin-Madison. Her research examines academic innovation and library transformation, cyber-infrastructure for transdisciplinary scientific and engineering research, global engineering education and global competency, data science practice and curation work, and social informatics. In today’s complex transdisciplinary problem space, challenges “span the full range of a comprehensive university from the arts, humanities, and physical sciences to engineering, business, design, and the social sciences” (Sands, 2017). Higher education institutions widely embark on new strategic movements and begin charting their future discourses through ground-breaking initiatives and disruptive transformations. Within the context of enterprise-wide academic innovation, there is the emerging horizon of intelligent infrastructure due to rapid developments in artificial intelligence, embedded sensing, pervasive computing, and ubiquitous mobility. The domain of intelligent infrastructure especially has a curious “fluidity” in its disciplinary boundaries, quickly reshaping knowledge bases and reproducing research methods. Already leading in many elements of intelligent infrastructure and determined to build on and connect these strengths, Virginia Tech (VT) is poised to become a destination for global talents in this signature area of development, or the so-called Destination Area. Particularly, this process leverages and integrates VT’s existing programs in smart design and construction, robotics and autonomous vehicle systems, ubiquitous mobility, energy, and materials through an infrastructure-based area of development, entitled Intelligent Infrastructure for Human-Centered Communities (IIHCC) (Virginia Tech Office of The Executive Vice President and Provost, 2017). To achieve this large-scale transdisciplinary convergence of intellectual domains, the university brought together a number of domain stakeholders to form a critical mass of researchers, practitioners, administrators, and developers who can then become a knowledge base and network driver for the IIHCC evolution. The academic libraries can, in this disruptive and transformative process, explore transdisciplinary encounters and discover boundary-crossing workflow challenges. By doing so and by adopting human-in-the-loop design and optimization, libraries can bridge information and communication barriers to help establish the community of practice or support community making for IIHCC. What are the IIHCC’s strategic direction, workflow challenges, and future landscape? How could academic libraries’ digital and physical architectures be transformed to support the IIHCC advancement? The outcomes strategize how academic libraries could innovate to expand data, information, and communication capacities and to effectively integrate into the organic, complex, and adaptive intelligent system. By forging an exemplary model in this advancing domain of global future, VT’s innovation may offer implications and inspirations for other sites of similar institutional portfolio and strategic priority to enable critical infrastructure development for smart and resilient communities. Intelligent infrastructure is beginning to emerge because “technology has made it feasible to collect, store, and analyze data on virtually every aspect of city operations.” In particular, “the availability of low-cost sensors, ubiquitous connectivity, and affordable cloud computing means that cities can connect every street lamp, bus, and municipal building to the Internet of Things” (Castro, 2017). Such an infrastructure uses data, analytics, and automation to address major urban issues, “from increasing the supply of affordable housing and efficient transportation to improving public safety and protecting the environment” (Castro, 2017). Intelligent infrastructure is a complex adaptive system. Such an intelligent system leverages the power of ubiquitous sensing, pervasive computing, artificial intelligence, and anywhere connectivity. It is set to transform the way we live, work, and experience the world in domains as diverse as healthcare, transportation, energy, manufacturing, finance, and agriculture. This transformation is realized through the complex and increasingly coupled relationships between humans, technologies, and their environments by way of smart objects and systems, such as robots, wearables, person-embedded sensors, virtual and augmented reality, digital fabrication and programable matter, computationally-enabled devices and building architectures, and so on. By essentially merging “the physical and virtual for both places and people,” an intelligent infrastructure features increasingly autonomous systems “that can sense and learn the human’s cognitive and physical states while possessing the ability to sense, learn, and adapt in their environments” (NSF, 2018). By doing so, it augments both human and computer capabilities to collectively distribute and assimilate information and knowledge as required and to deal with changes in their working environments and within themselves (SAC, 2018). This is an infrastructure that collects data and then processes and transforms the acquired data into timely, accurate, and relevant information (Shen, 2019) so as to drive autonomic responses and adapt to changing conditions (Prasad and Ruggieri, 2014; Weiss, 2009; Royal Academy of Engineering, 2012; Ogie, Perez and Dignum, 2017; Buckman, Mayfield and Beck, 2014). With such capabilities, intelligent infrastructure offers the promise of a transformed future where cyber-physical-and-human systems are interconnected and interdependent, and where lives are enriched with new knowledge and insights generated through data mobilization and information integration. The development of intelligent infrastructure thrives at the human-centered, technology-mediated, and environmentally-minded intersection of science, engineering, arts, and design (Shen, 2019). It aims to achieve the smart and connected future of human, society, and the environments. As an integral part of this intelligent infrastructure, modern library system in and of itself ought to be an intelligent system and thus “should be designed to achieve human-computer symbiosis and computer-mediated human communication, collaboration, and competition” (NSF, 2018). In this sense, an intelligent library system should bring novel technologies, new perspectives, as well as new models of inquiry, practice, and scholarship to research and education. As such, academic libraries’ roles as key data steward and information manager are further magnified and become more challenging and prominent than ever before, especially in the context of developing Intelligent Infrastructure for Human Centered Communities or IIHCC. For one, there are the needs to address progressively richer environments, larger-scale data, and more diverse computing platforms. On top of these, there are also expectations to support the diverse functionalities and processing needs for data, especially given its changing natures in complexity, scalability, interactivity, and heterogeneity. For another, IIHCC’s own advancement will increasingly depend on the abilities to “exploit data effectively for timely delivery of relevant and accurate information and for knowledge discovery” (NSF, 2018). Taking together, an IIHCC library system needs innovative approaches and deep insights for “smart” integration. With this in mind, the current study asks and addresses this timely question of how academic libraries’ physical and digital architectures should be transformed to support IIHCC and to realize the full transformative potential of data, information, and knowledge in this complex adaptive system. While intelligent infrastructure and related technologies hold great promise for societal progress and increasingly populate the global landscape, the related ethical questions and challenges should be carefully considered and addressed too. With such recognition, the discussion of user related data and sensing technologies in this current study is all grounded within the encompassing framework of ensuring safety, security, privacy, and trust in emerging technologies. Such discussion also falls within the bounds of following relevant industry standards, policies, and solutions established for maintaining integrated security in intelligent systems. Strategically anchored in this emerging horizon, the establishment of the IIHCC Destination Area at VT is designed to address and innovate these developments. To tackle today’s complex and wicked problems with many dimensions requires the synthesis of humanistic, scientific, and technological perspectives. Through a “Beyond Boundaries” vision and integrative approach (Virginia Tech, 2015), this initiative involves the Virginia Tech College of Architecture and Urban Studies, College of Engineering, and College of Science, as well as multiple leading institutes and centers. Launched in the spring of 2016, the development of the IIHCC initiative has been guided by the methodology of iterative design that involves “using what’s known to begin a project, then testing and refining along the way, incorporating feedback in real time to continuously improve and adapt to rapidly changing conditions” (Virginia Tech News, 2016a). The first phase of the initiative engaged faculty university wide to work in transdisciplinary design teams in order to define the area and create its framework without a predetermined road map. It included town-hall meetings, collection of survey data, and continuous review and refinement of findings that concluded with a vision statement, white papers, and related strength and gap analysis. The second phase immediately followed with the formation of a stakeholder committee to guide the development and fulfill specific tasks such as faculty cluster hiring, joint facility planning, curriculum development, research strategy formulation, and external partnership engagement. The committee includes deans, institute directors, and faculty members with demonstrated strengths and deep subject-matter expertise in the key components of the IIHCC area. Driven by collaborative leadership, these stakeholders have been brought together to charge the area development and guide the transformative discourse. Its membership thus exemplifies a rich knowledge base and provides a representative sample of participants for this current study. By design, the IIHCC area will provide new framework and produce impact of scale that span research, education, and engagement and involve all interested internal and external constituents (Virginia Tech News, 2016b). VT Libraries are a critical part of the university’s academic infrastructure that provide services and support across the spectrum of research, education, and engagement and need quick response to emerging opportunities and changing priorities. As network sensing, digital fabrication, and system automation “configure new imaginaries of designing and making across fields” (Design Research Society, 2018), the university library system can begin the process of partnering with the IIHCC scholars in its own designing and making for smart library integration. This is becoming important as intelligent infrastructure development increasingly aligns with data mobilization and information access initiatives that are at the center of today’s academic library operation and innovation. To support the building of an integrated library architecture into IIHCC, this study provides critical perspectives and creative insights on the role of modern library system in the design and construction of our built environments and smart communities. To probe new library solutions, this study envisions alternative modes of design participation and discourse engagement for libraries to join the academic innovation. As a result, this study presents a schematic view of how the IIHCC evolution shapes new library infrastructure and how a smart library system can mobilize the IIHCC advancement. As such, this study bears both research significance and empirical importance. While there are disparate strands of work exploring the challenges, opportunities, skill demands, and changing roles associated with implementing data science, AI techniques, and research data management within library environments, no prior research has been done to project and configure future library system as an integral part of intelligent infrastructure for smart community development. This study advances the state of the art by building a blueprint for human-centered smart library architecture. It supports the strategic planning, visioning, and designing practice for academic libraries to effectively integrate into the innovative landscape and transformative discourse of the academic enterprise. This study also makes theoretical contributions. Drawing upon e-science theories (Atkins, 2003; Bowker, 2005; Nentwich, 2003) and socio-technical model of knowledge practices, this study investigated data working and knowledge making dynamics in a future-facing, boundary-transcending intellectual domain of global significance. In the “socio-technical sphere,” knowledge practices are “embedded within and enabled by technical systems” (Meyer, 2014; Meyer et al., 2019). This study expands this installment and includes a third dimension of physical spaces in the knowledge dynamism. By examining the changing knowledge space, shifting data paradigm, and team science practice in a cyber-physical-human integrated environment, this study envisions an interconnected and interdependent world of people, spaces, and technologies facilitated by both physical and virtual architectures of “smart” libraries. To comprehensively address the above research questions, the Principal Investigator (PI) conducted extensive document study and background research by reviewing and reflecting on IIHCC’s vision plan and white papers, progress reports and stage updates, as well as press releases and media coverage from the spring of 2016 when the IIHCC initiative was launched throughout 2017 when this research was performed. To further gain a grounded and contextualized understanding, the PI engaged as a participant by attending and observing IIHCC-related public events, open forums, research workshops, and town-hall meetings. The insights gained from the content analysis and ethnographic fieldwork then provided a framework to design the interview study with members of the IIHCC Stakeholder Committee. The interview study adopted empirical qualitative research design and methodological recommendations of Yin (1994), Stake (1995), and Creswell (2013), and applied the critical incident technique of Flanagan (1954). By design, the research interviews took into consideration of experiential aspects, emergent issues, and substantive interpretation. By techniques, the interview questions emphasized practical examples, significant experiences, and typical scenarios surrounding human interactions with various technologies, including data and information systems, and with physical environments. As with qualitative research, this study focuses on practical issues and actual contexts and does not purport to be numerically intended or statistically representative. Following a carefully designed protocol, the semi-structured interviews centered around the IIHCC strategic design and development, and within such framework, the needed library innovation and architectural transformation in the age of “smartness.” In particular, the interview questions ranged from the IIHCC working dynamics and development process, data infrastructure and scenarios, architectural design and human factors, to library innovation and capacity building. Over the spring and summer of 2017, the PI contacted and invited members of the IIHCC Stakeholder Committee and a few representatives in its closely related Data and Decisions Destination Area for in-depth interpersonal interviews. A total of 9 people agreed to participate. It provides an appropriate sample size for grounded analysis and inductive reasoning and meets qualitative research sampling requirements (Creswell, 2013; Yin, 1994). These participants come from different colleges, including Architecture and Urban Studies, Engineering, and Science, as well as leading research institutes and laboratories. They broadly represent the interconnected areas of biological systems engineering, computer science, building construction, automated vehicles and human factors engineering, transportation safety, industrial and systems engineering, mechanical engineering, social and decision analytics, and statistics. Following all appropriate human subjects procedures, the interpersonal interviews took place at the participants’ work locations or otherwise through telephone or Skype. The duration of each interview lasted from 45 minutes to one hour. A written consent or virtual consent was gathered from each participant. All interviews were audio-recorded, fully transcribed, and professionally analyzed using open coding and axial coding. By adopting multiple sources, the mixed-methods approach enables the triangulation of evidence and cross-validation of results. Being a qualitative research and focusing on an evolutionary new field of development, this study does not purport to be statistically representative nor are the recommendations meant to be prescriptive. The following sections synthesize the primary results and provide related discussion and suggestions. 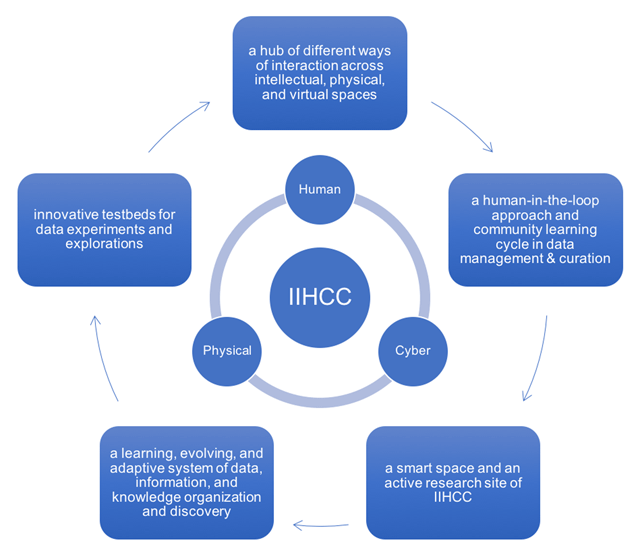 The IIHCC initiative envisions the development of innovative discovery channels, creative learning spaces, and integrated cyber-physical-human systems for a smart, connected community. In such endeavors, libraries can play the role of smart integrator and catalyzer in developing an even greater blend of living, leaning, and research experiences for faculty and students. Such role of innovation is six-fold as elaborated in the following sections. Today, with accelerated technology transformation in robotic and autonomous systems, networked sensors, and smart engineering, the next generation libraries need to anticipate evolving scenarios such as the ubiquitous use and integration of networking, sensing, and tracking technologies in physical environments, in human activities, and in their daily movements and interactions. On top of that, libraries need to consider the various data science scenarios and applications as results of the technological augmentation and system automation. Data and information will certainly hold the key to all smart solutions. There is evidently a growing interest among the participants in performing active content mining and adaptive machine learning for the analysis of dynamic data streams from diverse sources. In correspondence, they believe that libraries in the new age could support data science learning and applications by serving as testbeds for experimental design, model testing, and exploratory discovery. In particular, by purposefully designing and organizing student competitions around the IIHCC generated data assets, libraries as innovative testbeds can drive creativity and ignite ingenuity among students. For example, one participant commented that “we should become the test case for the world in how people interact with our data” and have student “competitions around our data and ways to drive it, like the Solar Decathlon.” In this analogy, the Solar Decathlon is a collegiate competition hosted by the U.S. Department of Energy that challenges student teams to design and build high performance and innovative buildings powered by renewable energy. To do so, libraries could provide original datasets, curated collections, and operational platforms to enable benchmarking of machine learning algorithms or support testing of data mining techniques by students. In particular, libraries should connect students with the IIHCC-originated research data and allow them to experiment, mine, and explore in innovative ways in order to address questions that are driven by real-life community concerns and practical challenges. As articulated by a participant, the questions are “how to find out who are working on what right now, what data they have had, and how we bring that in.” In this opinion, “it could be as simple as data dictionaries for what we have collected.” As the interviewee further explained, “we do nice data dictionaries typically for our work that show variable names, description of the variables, type of the variables, and source of the variables, where kids can just go mine this stuff and look for interesting ways to do it.” Our libraries could certainly lead such efforts. By supporting and driving purposeful problem-solving and impactful decision-making among students and by showcasing their practical achievements, the library-hosted data platform can in turn generate opportunities to engage industry, gather sponsorship, and attract funding. This way, libraries will not only bring competitive advantages to the VT data, but also act as an effective engine of public or private funding and industrial partnership, and thus extend their capacity to producing societal impact. One interviewee encapsulated these points in a practical example. Above all, being a vigorous curator of data and active adopter of new technologies, academic libraries should provide opportunities and resources to immerse students in learning, experiencing, and experimenting with different aspects of data science techniques, machine learning objects, and AI environments. Doing so will help libraries establish a brand that is virtually synonymous with data steward and information manager. Situated at the intersection of database development, information retrieval, and knowledge management, modern library systems together with smart infrastructures and built environments should be interconnected and mutually optimizing. The development of intelligent infrastructure is based on interoperable communication protocols to enable the dynamic interactions and smooth integration of virtual environments, human activities, and physical systems. These include components such as computers, smart devices, sensors, cars, buildings, energy systems and power grids, and so forth. With advanced development, they can be seamlessly integrated into the information network and their interactions can be realized through the provision of intelligent interfaces (FiCloud, 2017). This innovative infrastructure challenges the existing data and information network to extend its scope to dealing with real world objects in a more distributed and dynamic manner. Being a critical point of data and information access and as an organic component of intelligent infrastructure, the library system needs to promote integrated living-learning-and-research experiences. This view is reflected in the following scenarios depicted by different interviewees, with a particular emphasis on virtually and physically integrated spaces for human-centered interactions and development. Beyond the above scenarios, one participant summarized the role of future libraries as a hub of “different ways of interaction” in the intelligent infrastructure realm. In this view, the values in each of these intellectual, physical, and virtual spaces will converge in the library setting and be magnified when they are utilized in conjunction. All the scenarios above illustrate seamless space and technology integration that is culminated in an interactive visualization framework coupled with dynamic data platform and powerful computing mechanism. Such configuration allows for greater dimensionalities of knowledge pursuits, from improvising cross-disciplinary data explorations, to performing collaborative searching and synthesizing, and to orchestrating creative and interactive visualizations, all of which serve to catalyze new ideas and novel discoveries. In this sense, libraries can act as the community knowledge base and information interface to spark convergence across the many disciplinary dimensions and intellectual components of IIHCC. To achieve the above scenarios, the university libraries need to engage and collaborate with VT’s leading programs and leverage its signature strengths in areas such as search and discovery, data mining, information retrieval, knowledge discovery, and database development. For examples, among the interviewees, there are faculty scholars who already conduct leading-edge research and development in library-relevant areas, ranging from data collection, organization, integration, synthesis, and presentation to interactive search, discovery, and visualization. They are deeply involved with “managing large quantities of data for socio-technical systems” and their work is often driven by machine learning techniques and human-in-the-loop concept as indicated below. In all these different dimensions of Human Data Interaction (HDI) research and practice, libraries could certainly partner with these faculty experts in research operation and technology development to advance state of the art of the fields. Then in return, the libraries could quickly test, evaluate, adopt, and implement the resulting tools and advanced techniques being developed at the front line, while acting as an active site of technology transfer. Pioneering in the art and science of data, the participants also demonstrated a much broader vision of what future digital data library system should look like. They provided grand new perspectives by specifying a broader spectrum of library functionalities and service provisions in the new age. For example, one interviewee described a distinct view and their own quest for developing an advanced and uniquely positioned digital library system specifically for large-scale social science experiments. In this vision, the digital library collection should encompass experimental data – including both human subject experiments and simulation experiments, and synthetic or simulated data, as well as real-world data. It should also provide a rich data working platform and informatics environment with sophisticated tools to support realistic time-series analysis and network analysis. Furthermore, this digital library system should be equipped with machine learning algorithms for deep-dive social science modeling and causality analysis. In sum, the scientists’ vision and design thinking of a digital library system integrates their deep values placed on working in an open, collaborative, and community environment. In this environment, they would contribute and publish software, code, and data in an openly accessible format and in a consistent and replicable way that support the reproducibility, integrity, and usability of research. These values coincide with the core principles of open data movement that modern academic libraries strongly resonate with, and thus signify great potentials for a much broader stage of IIHCC-library collaboration and partnership. In addition to the existing faculty expertise and their ongoing endeavors, signature programs such as the Virginia Tech Transportation Institute (VTTI) and Biocomplexity Institute (BI) are doing frontier work in areas such as data quality management, documentation, organization, representation, extraction, integration, and provenance tracking. They have developed their own regimens of data stewardship and possess advanced techniques and unique insights in the realm of data management. For example, within VTTI, the Center for Data Reduction and Analysis Support (CDRAS, 2017) provides dedicated data services ranging from coding of video and audio data, quality assurance, standardization, extraction, event selection, to analysis. It supports the full lifecycle of data scholarship in transportation research. Another example is the Social and Decision Analytics Laboratory (SDAL) based within BI (2017). It actively engages in “the science of all data” by integrating disparate sources and drawing actionable insights out of messy data sets in order to deliver a comprehensive understanding of societal problems and provide real-world solutions (SDAL, 2017). As characterized by the SDAL Director, “we look at data and think ‘collect, liberate, and repurpose’” and “we continually question how we can use data in ways that benefit communities” (Virginia Tech News, 2017a). Such quest for knowledge was further elaborated by the interviewees as follows. The work of SDAL provides an exemplary model of data processing, wrangling, and analyzing framework for integrating data across diverse sources in order to produce robust analysis and sound results. As characterized by an interviewee, they are actually defining, designing, and developing rigorous data science processes in a federated fashion and in a platform way. To put in a broader context, one interviewee also described the major drawbacks and potential pitfalls of the mainstream data repository development efforts and the related funding patterns. Particularly, it was considered “worthless in the long run,” if people are still trying to fund and develop “massive data warehouses” as these will end up being “another set of information that people don’t use.” Instead, the interviewee believes that an effective mechanism for developing data management system should involve a “community learning cycle” as explained below. In the above view, data management takes on a new meaning and operational trajectory. Particularly, it is no longer revolving around data warehouses or repository systems but entails data science processes and platforms situated in a dynamic environment that can learn, evolve, and adapt to community needs and problem solving. In this sense, data management cycle is a “community learning cycle.” Effective data management goes beyond the concept of a “static” data library system and involves real-time data capturing and metadata provenance tracking as well as dynamic data processing in order to accommodate ongoing research and simultaneous contributions by multiple people. This is further illustrated in the interviewee’s following comments. In contrast to the typical view of data management that is mostly static and standardized, the above data platform approach features live data management and process capturing, and most uniquely, automated linking, reconciliation, and harmonization, all weaving into a federated process and synchronized system. In this advanced space, the university libraries have a great deal to learn from these frontier researchers and leading programs that are already practicing, crafting, and performing advanced data modeling, information processing, and knowledge mining at VT. After all, a real “smart” library is a learning, evolving, and adaptive system that always seeks and incorporates leading-edge work and technologies in the field. Concurrent to the university’s ground-breaking initiative, the VT Libraries are actively planning and carving out new spaces for innovation and creative scholarship. The concept of intelligent infrastructure and the idea of smart design and construction can certainly be applied here in their space design, room construction, and architectural innovation. The current research participants echoed this idea and projected future library architectures and functionalities. To support the development of innovative discovery channels and creative learning spaces, library itself could become a smart infrastructure. By this concept, it can collect data, make sense of human information behaviors, be adaptive to new ways of living and learning, and be adjustable to new modes of research and collaboration. In the interviewees’ opinions below, library space itself could even turn into and serve as an experimental setting for smart infrastructure research and development. In these novel views, library can become a living-learning lab that senses and studies human dynamics, human-computer interactions, and human-building interactions. Such an innovative space can be achieved by working with IIHCC to apply smart design and construction to library space, by embedding sensor networks, by monitoring and modeling user behaviors, by collecting and analyzing event-related data, and by studying human-building or human-space interactions. Of course, such collection and utilization of user data must strictly follow the data protection and ethical guidelines established within the integrated security framework that is being broadly studied and continuously evolving with the intelligent infrastructure development. By recognizing potential challenges and benefits of IIHCC and by carefully approaching technological innovation, library can effectively be part of the “smart” integration. By doing so, the library innovation space becomes a “smart space” and an active research site where interested scholars from different disciplines can explore group dynamics, user experiences, and collaborative decision-making in this future-facing, integrated environment. For examples, in this space, researchers can conduct human-computer interface experiments, study visual analytics and teamwork effects, explore data visualizations, or even investigate collaborative annotation practices grounded in textual evidence, all of which opens up a wealth of new opportunities for cutting-edge research and discovery. This way, the library will not only serve and realize cyber-physical-human integration, but also offer a fertile ground for all-encompassing, broad-spectrum IIHCC-library research partnership and education entrepreneurship. This may further lead to a myriad of opportunities in grant funding, technology transfer, and industrial partnership. Noteworthily, the library support of IIHCC development needs to be tailored to real-world problem solving and industry practical applications. This requires us to leverage collective intelligence of all sorts and build creative partnership. To put students “in-the-loop” and engage their participation, the university libraries could host a collegiate competition that challenges student teams to design ways and build strategies for “Integrating Libraries into Smart Infrastructure.” This way, the libraries not only provide testbeds for student-led proof of concept and creative design, but can also crowd-source, cross-pollinate, and harness new ideas originated from students to drive modeling, simulation, and prototyping of a smart library architecture. Additionally, the libraries could serve as a unique venue to bring together industry and academia to present, exchange, and discuss state-of-the-art research and development in critical library-relevant areas, such as search and discovery, data platform design, and smart recommender system. Cultivating an effective and productive IIHCC-Library partnership through data assets will further generate great opportunities for industry collaboration and enterprise funding, to the benefit of all. As the university is exploring ways to push traditional limits in order to redefine the role of a land-grant research university in the 21st century (Virginia Tech News, 2017b), its libraries need to be forward-looking and transcend existing constraints as well. With intelligent infrastructure and ubiquitous mobility gradually weaving into the fabric of academic lives, libraries have new roles to play. Such new roles will transform libraries into innovative testbeds for data experiments and explorations, into community knowledge base and intelligent information interface, into a learning and adaptive data and information system, and into a smart space for a whole new array of research partnerships and pedagogical practices. To achieve such goals, the academic libraries will need to connect students with the IIHCC-originated research outputs and provide original data assets, curated collections, and operational platforms to enable experimental design, model testing, and exploratory discovery. They will serve as “testbeds” for data science learning and applications. The academic libraries will need to provide virtually and physically integrated spaces featuring interactive visualization capabilities coupled with a dynamic data platform and powerful computing mechanism to allow for knowledge pursuits, from improvising cross-disciplinary data explorations, to performing collaborative searching and synthesizing, and to orchestrating creative and interactive visualizations. They will act as “a hub of different ways of interaction” across intellectual, physical, and virtual spaces. Furthermore, the academic libraries will need to adopt frontier knowledge in Human Data Interaction and act as an active site of technology transfer. They will become “a learning, evolving, and adaptive system” of data, information, and knowledge organization, management, and discovery. The academic libraries will need to incorporate exemplary data science processes and platforms that cater to dynamic environments and adapt to community needs and problem solving. They will take on a “human in the loop” approach and “community learning cycle” in data management and curation. The academic libraries will need to apply smart design and construction to their spaces so as to facilitate human-building or human-space interactions. They will become a “smart space” and an active research site of IIHCC. Above all, the academic libraries will need to serve and realize cyber-physical-human integration and become a catalyst for IIHCC-library research partnership and education entrepreneurship. In synthesis, Figure 1 illustrates the key attributes of a smart library architecture as being integrated into the intelligent infrastructure framework. Key attributes of a smart library system integrated into IIHCC. In the above framework, an effective IIHCC data working system will naturally and agilely be guarded by ethics guidelines and security considerations, which in fact constitute another large, complex, and critical field of research and development that is currently being rigorously addressed by the Integrated Security Destination Area (ISDA) at VT. Future research could investigate ISDA stakeholders’ thoughts and opinions regarding how the institutional infrastructure should approach the ethics, privacy, and intellectual property challenges associated with data sharing, publishing, and use. Such efforts will further optimize the institutional data environment and fortify its security architecture. Looking into the future through illustrative examples, conceptual modeling, and scenario planning, this research projects a novel vision for the future of academic libraries. It proposes a new socio-technical configuration of library physical, virtual, and intellectual spaces that can spark novel ideas, drive experiential learning, engage collective intelligence, and catalyze creative partnership. In this configuration, libraries are located at the connections of people, information, spaces, and values, and can become the central hub for different forms of interactions among them. Theoretically speaking, these new developments also represent a brand new horizon and provide exciting new opportunities for library and information science scholarship. As intelligent infrastructures are “equipped with dynamic and autonomous adaptation capabilities to deal with changes” (SAC, 2018), there is the need for library and information science researchers to consider new sense-making models for context awareness and examine user-adapted interactions with smart objects when studying human information behaviors. There is the need to develop new information search models and map information seeking processes in the complex adaptive system and integrated environment. This study was approved by the Virginia Tech Institution Review Board (IRB) under VT IRB-16-1080 and followed all appropriate procedures involving human subjects. An informed consent to participate in this study was obtained from each of the participants. Atkins, DE. 2003. Revolutionizing Science and Engineering Through Cyberinfrastructure: Report of the National Science Foundation Blue-Ribbon panel on Cyberinfrastructure. Washington: National Science Foundation. Available at: http://hdl.handle.net/10150/106224 (Last accessed 16 November 2017). Biocomplexity Institute (BI) of Virginia Tech. 2017. Available at: https://www.bi.vt.edu/ (Last accessed 18 August 2017). Bowker, GC. 2005. Memory Practices in the Sciences. Cambridge, MA: MIT Press. Castro, D. 2017. Building the learning city. Government Technology. Available at: http://www.govtech.com/data/GT-September-2017-Building-the-Learning-City.html (Last accessed 1 October 2017). Creswell, JW. 2013. Qualitative Inquiry and Research Design: Choosing among Five Approaches (3rd ed.). Washington DC: Sage. Design Research Society. 2018. The Design, Technology and Society track at the Design Research Society Conference. Available at: http://www.drs2018limerick.org/track/design-technology-and-society (Last accessed 12 January 2018). FiCloud. 2017. IEEE 5th International Conference on Future Internet of Things and Cloud. Available at: http://www.ficloud.org/2017/ (Last accessed 8 November 2017). Meyer, ET. 2014. Examining the Hyphen: The Value of Social Informatics for Research and Teaching. In: Fichman, P and Rosenbaum, H (eds. ), Social Informatics: Past, Present and Future, 57–74. Cambridge, UK: Cambridge Scholarly Publishers. National Science Foundation (NSF). 2018. Information and Intelligent Systems (IIS): Core Programs. Available at: https://www.nsf.gov/pubs/2018/nsf18570/nsf18570.htm?WT.mc_id=USNSF_25&WT.mc_ev=click (Last accessed 28 August 2018). Royal Academy of Engineering. 2012. Smart infrastructure: The future. London, UK. Available at: http://www.raeng.org.uk/publications/reports/smart-infrastructure-the-future (Last accessed 14 March 2018). SAC. 2018. The 33rd ACM Symposium on Applied Computing (SAC) Special Track on Collective and Cooperative Systems: Aims and Scope. Available at: http://sac-cas2018.apice.unibo.it/cfp.html (Last accessed 16 January 2018). Sands, T. 2017. A message from Virginia Tech President Tim Sands on Destination Areas. Available at: https://vtnews.vt.edu/articles/2017/04/president-message040617.html (Last accessed 7 August 2017). Stake, R. 1995. The Art of Case Research. Newbury Park: Sage Publications. The Center for Data Reduction and Analysis Support (CDRAS). 2017. Available at: https://www.vtti.vt.edu/research/cdras/index.php (Last accessed 9 July 2017). The Social and Decision Analytics Laboratory (SDAL). 2017. Available at: https://www.bi.vt.edu/sdal/about (Last accessed 24 October 2017). Virginia Tech. 2015. Envisioning Virginia Tech: Beyond Boundaries. Available at: http://www.beyondboundaries.vt.edu (Last accessed 6 March 2018). Virginia Tech News. 2016a. Next phase of Beyond Boundaries starts with stakeholder committees using collaborative leadership model. Available at: https://vtnews.vt.edu/articles/2016/12/provost-collableadership.html (Last accessed 31 August 2018). Virginia Tech News. 2016b. Destination Areas milestone reached; faculty to lead next phase of development. Available at: https://vtnews.vt.edu/articles/2016/11/provost-da-update.html (Last accessed 31 August 2018). Virginia Tech News. 2017a. Social and Decision Analytics Laboratory, Arlington County team up. Available at: https://vtnews.vt.edu/articles/2017/04/social-and-decision-analytics-laboratory-and-arlington-county-te.html (Last accessed 15 May 2017). Virginia Tech News. 2017b. Virginia Tech Magazine winter 2017. Available at: https://vtnews.vt.edu/articles/2017/02/unirel-vtmagwinter17.html (Last accessed 10 July 2017). Virginia Tech Office of The Executive Vice President and Provost. 2017. Destination Area: Intelligent Infrastructure for Human-Centered Communities. Available at: https://provost.vt.edu/destination-areas/da-overview/da-infrastructure.html (Last accessed 29 November 2017). Virginia Tech Transportation Institute (VTTI). 2017. Available at: https://www.vtti.vt.edu/ (Last accessed 18 August 2017). Yin, RK. 1994. Case Study Research: Design and Methods (2nd ed.). Thousand Oaks: Sage.